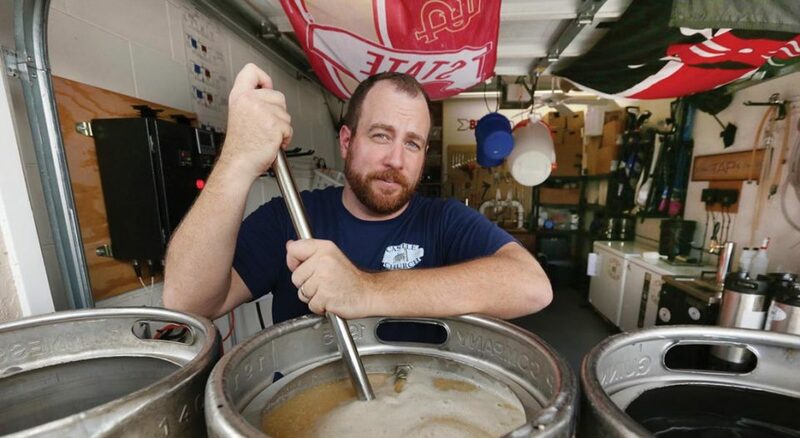 Aaron Schmalzle spent years helping churches and faith-based organizations become sustainable while also practicing his hobby of brewing beer in his garage-turned-brewery. His combined passions helped form the vision of Castle Church Brewing Community in Orlando, Fla.
Tom Schaeffer (left) started Black Cloister Brewing Co. as a way to share his love of great beer and a place to build community. That community includes Threshold Church in Toledo, Ohio, which uses the brewery as its Sunday worship space. Schaeffer is pastor of Threshold. Threshold Church worships at Black Cloister Brewing Co., a brewery whose name pays homage to the original Black Cloister in Wittenburg, Germany, where Martin Luther studied. Every night for two weeks, ELCA discipleship veteran and amateur beer maker Aaron Schmalzle had the same dream. He was in a sanctuary, but instead of pews there were long tables, and the organ pipes had been replaced by massive brewery stacks. 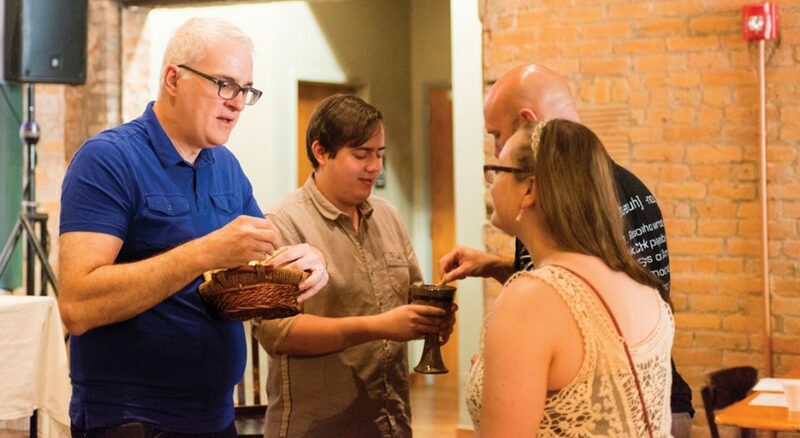 In many ways, that moment was the birth of Castle Church Brewing Community, a non-traditional ELCA congregation that focuses less on weekly worship attendance and more on igniting a sense of faith in daily life. And, of course, there’s beer. 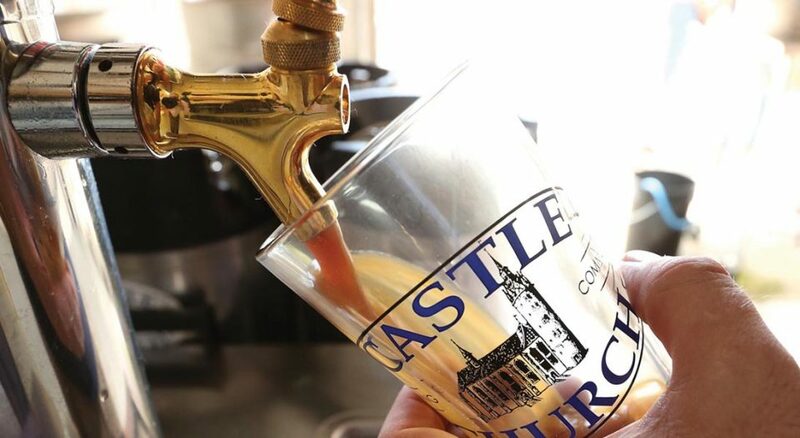 After more than a year of planning, the brewery’s projected opening is next year, but Castle Church is already an active congregation, led spiritually by Witt. Castle also has a weekly yoga session and monthly brew days, as well as house groups that include Bible studies. Witt was happy at his previous call, but he believes there is a growing dissatisfaction among millennials with the traditional congregational model. When Schmalzle and Witt began planning how Castle Church would operate, their vision included a concept of concentric circles. On the inner circle are worshipers looking for weekly word and sacrament. The middle circle includes people who show up for special events, such as beer and hymns or speakers. The outer circle could include beer enthusiasts who aren’t even aware of the faith community at the brewery. Castle’s relaxed atmosphere is meant to let people be their authentic selves without fear of judgment or expectation. Schmalzle believes that involvement will be more fulfilling if Castle meets the spiritual needs of each individual. Starting a congregation, let alone a brewery, is costly and complicated. Witt and Schmalzle praised the ELCA and the Florida-Bahamas Synod for their support, in particular the synod bishop, Robert Schaefer. “It seems to me Castle Church community is one glimpse of what the church of the future is going to look like,” Schaefer said. “In our context the majority of traditional mission starts, in spite of our best efforts, never grow into sustainable congregations. I’ve been encouraging our synod to a time of holy experimentation and risk-taking for the sake of the gospel. Though Castle is unusual, it’s not unique. Threshold Church in Toledo, Ohio, is in its second year. Its pastor and avid beer maker, Tom Schaeffer, is also the CEO of Black Cloister Brewing Co., which is where Threshold’s Sunday worship takes place. Like the guys at Castle, Schaeffer’s motivation to merge faith and taproom communities is to reach a generation that has left the church because it doesn’t address their spiritual needs. 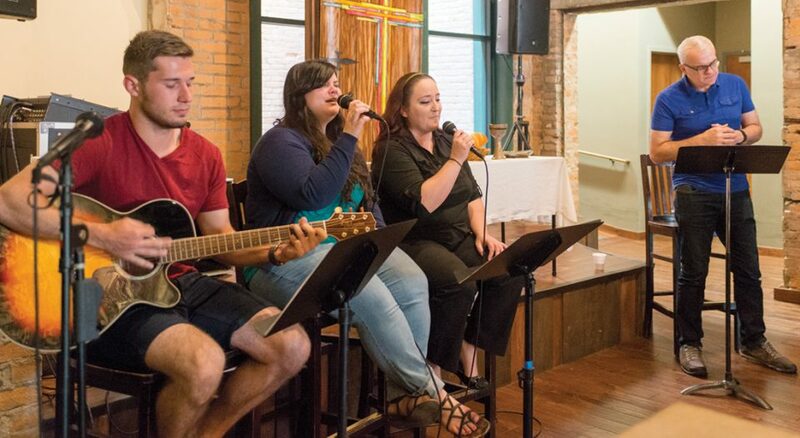 Threshold, which is also the Lutheran campus ministry for the University of Toledo, doesn’t consider its Sunday worship a primary evangelism tool. The way to do that, Schaeffer said, is to provide a space where the un-churched, the de-churched, and even the agnostic and atheist feel welcome. Like Castle, Threshold has received ELCA support. But there has been some pushback from people who find the brewery-congregation concept discriminatory against people who don’t drink or who may suffer from alcohol addiction. The question remains whether Castle and Threshold can be financially viable. For more information on Castle Church and Threshold, visit castlechurchbrewing.com and crossthethreshold.com. Favre is an assistant professor at Pierce College in Los Angeles and a frequent contributor to Living Lutheran.